Because the aortic dilation of Marfan's may not be outwardly apparent, it is important for a child with this condition to be examined regularly by a cardiologist. Medications, such as beta-adrenergic and angiotension receptor blockers, may be prescribed in an attempt to keep the aorta from enlarging. 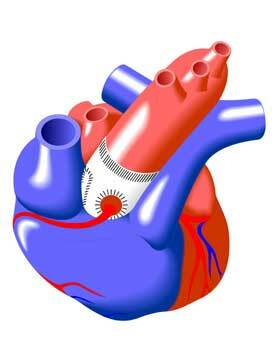 In some cases, surgical replacement of an enlarged section of the aorta may become necessary. A child with Marfan's should also be checked regularly for nearsightedness and for curvature of the spine (scoliosis). The latter may require the patient to wear a removable brace, prescribed by an orthopedic surgeon. People with the disorder are usually advised to avoid strenuous exercise because of the danger of aortic rupture. However, depending on the severity of aortic enlargement and valvular disease, people with the syndrome may expect long and active lives.